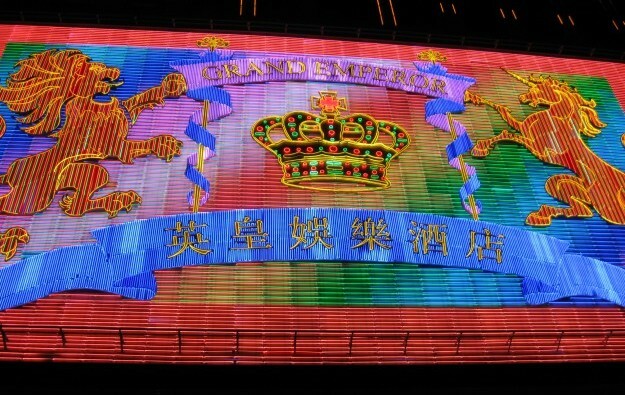 Gaming revenue at Emperor Entertainment Hotel Ltd, the operator of one of Macau’s so-called satellite casinos, fell to HKD546.7 million (US$69.9 million) in the first half of its financial year ended September 30. Emperor Entertainment Hotel recorded revenues of HKD586.6 million in the same period last year. In describing first-half gaming, the firm told the Hong Kong Stock Exchange on Wednesday: “While [the] VIP segment delivered stable performance, [the] gaming concourse segment was lacklustre as a result of capacity expansion in Cotai.” That was reference to large-scale casino resorts in a landfill zone across the water from Macau peninsula. “Nevertheless, the group strived to enhance the table yield and improve customer segmentation, which enabled the group to mitigate, to a certain extent, the impact of heightened competition,” Emperor Entertainment Hotel added. Decline in gaming revenue reduced first-half revenue in all the conglomerate’s businesses, which dropped by 5.2 percent to about HKD665.59 million. Even so, the first-half profit attributable to the owners of the company rose by 8.7 percent to slightly more than HKD128.94 million. Last year’s first-half profit was HKD118.6 million. The company’s board has declared an interim dividend of HKD0.028 per share. Emperor Entertainment Hotel runs a casino in its Grand Emperor Hotel (pictured) in Macau, using the gaming licence of SJM Holdings Ltd. The hotel has six gaming floors, together covering more than 130,000 square feet (12,077 sq metres), that house slot machines with an aggregate capacity to serve 170 customer seats, and 67 gaming tables in the main-floor gaming concourse; plus a single VIP room containing 10 tables. The company reported the first-half gross win in the Grand Emperor Hotel gaming concourse fell to HKD552.3 million from HKD626.5 million a year earlier. Revenue from the gaming concourse fell to HKD309.8 million (about 46.5 percent of the group’s total revenue) from HKD350.6 million a year earlier. The average win per table per day fell to HKD45,000 from HKD51,000. In the hotel’s VIP room, rolling chip turnover fell to HKD9.7 billion from HKD10.4 billion. Revenue from the VIP room fell to HKD217.4 million from HKD217.9 million. The average win per table per day fell to HKD209,000 from HKD210,000. The gross win from slot machines in the Grand Emperor Hotel rose to HKD41.2 million from HKD38.1 million as the number of seats increased to 170 from 155. Revenue from slot machines rose to HKD19.5 million from HKD18.1 million. The average daily win per seat fell to HKD1,332 from HKD1,339. The Grand Emperor Hotel, on Macau peninsula, is in a 26-storey building with a gross floor area of about 655,000 square feet, containing 311 guest rooms. The group also has a mid-range, 287-room leisure and business hotel on Taipa, near the Cotai Strip, called the Inn Hotel Macau. The statement to the Hong Kong exchange said the outlook for Macau was “positive” given the “long-term growth prospects for Macau’s gaming market given the increasing visitation and penetration of Chinese tourists to the city”. Commentary in the financial statement suggested improvements in transport were helping to deliver more mainland Chinese tourists to the city. Last year, the company saw a 13.6-percent year-on-year increase in profit – HKD393.6 million compared to HKD346.5 million in 2016 – although revenues had decreased.